Liver is the largest internal organ in the body. There are several different types of cancer for Liver, and the most common cancer is called. Hepatocellular carcinoma. Liver is the largest internal organ in the body. 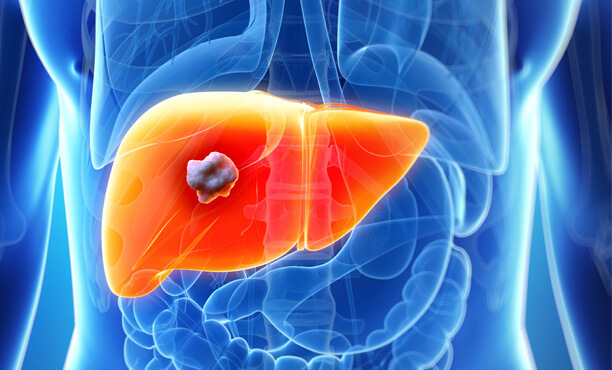 There are several different types of cancer for Liver, and the most common cancer is called. Hepatocellular carcinoma. Hepatocellular carcinoma has different growth patterns like tentacle like growth, nodule form of tumour and few develop as a single tumour that spreads to other parts of the liver. According to World Health Organization (WHO) around 30 cases of liver cancer are reported in 100,000 people worldwide every year. Liver cancer is the 10th most common case that develops in both men and women. Generally more men are affected with liver cancer than women. Liver cancer has a 1 year survival rate in most of the patients. In few rare cases 5 year survival rate is also observed depending on the condition of the patient. During the physical examination, your doctor will try to feel the lumps in the liver, abdomen and spleen. The abnormal build-up of fluid is also checked along with the signs of jaundice. Blood tests are mainly to done to detect the presence of AFP (alpha fetoprotein). AFP is generally produced by liver tumour. Blood tests also help in detected the elevated levels of AFP and how well the liver is functioning. Ultrasound also called as ultrasonography is an imaging test that uses high frequency sound waves to create clear pictures of internal organs and shows the exact location of the tumours. Computed tomography scan or CT scan provides a 3- dimensional picture using x-rays. CT scan helps in viewing the cross sectional view and abnormalities of tumour and the extent of the diseases. A special dye is generally used before the scan to create a clear picture. MRI uses a magnetic field to produce a detailed image of the tumour. MRI mainly helps in measuring the size of the tumours. If you are diagnosed with liver cancer and wants to get it treated with minimally invasive procedures, then you must consult Dr. Abhilash Sandhyala, one of the famous best Interventional Oncologists in Hyderabad.